North face of the Grandes Jorasses represents dreams, ambitions, tragedy and mystique. Alpinists through the decades have become addicted to the face. Once in a while they return back to the shadow and climb out to the light again. 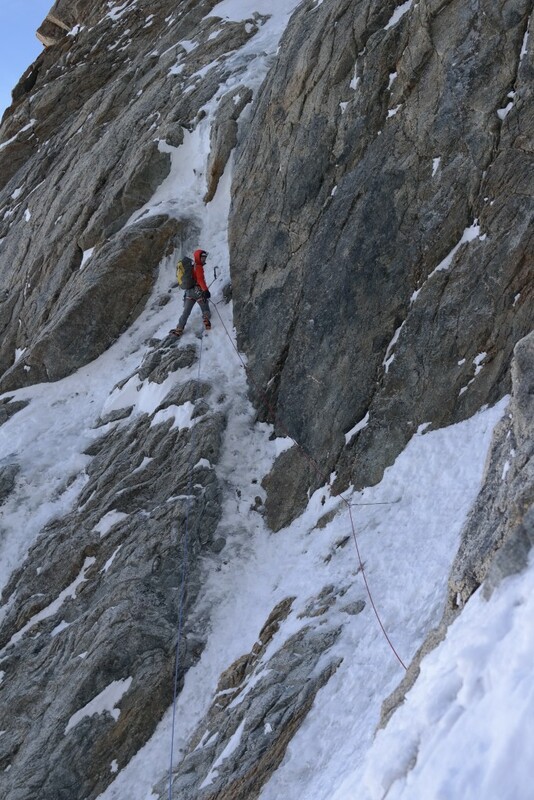 Nick Colton and Alex MacIntyre invented or, at least strengthened light and fast alpinism with a brilliant first ascent of the central couloir of the north face in 1976. Nowadays their route is one of the most popular on the face. Thanks to Ueli`s speed climb and quality of the line. 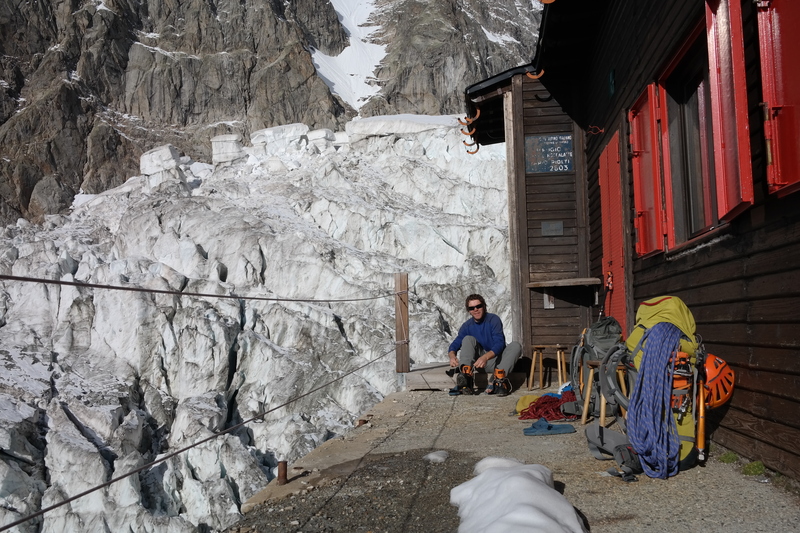 In October 2014, having just bailed from the Supercouloir, we took Montenvers train up to Mer de Glace and hiked straight to the schrund. We knew the Leschaux refugio would be full – three other teams also bivied under the face. We consirided to change to Croz, but conclusion was that we just have to start earlier than others. 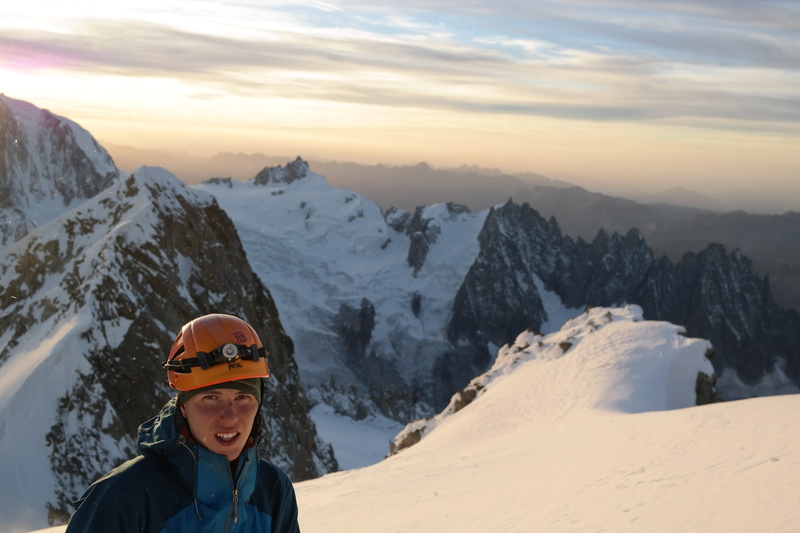 It was a warm evening top of the serac. 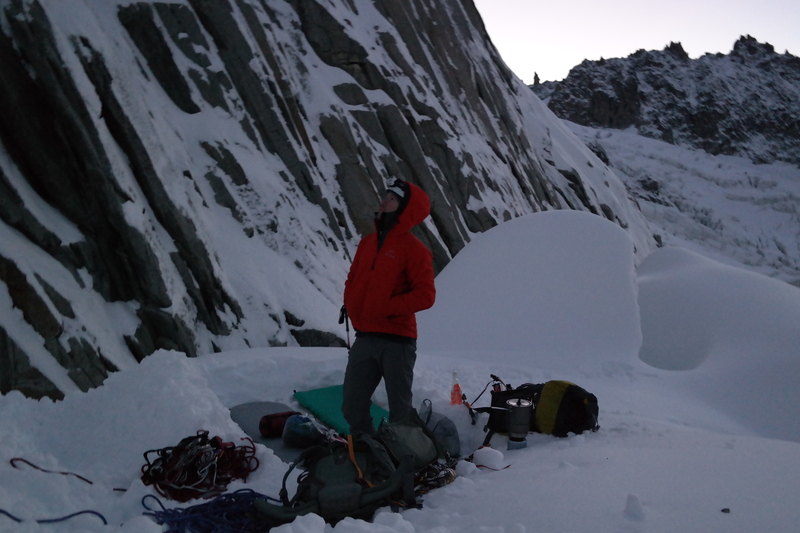 Climbers on No Siesta seemed to have no siesta as their moved slowly upwards, headlamps flashing around all night. At 03:00AM we set off and just barely got the pole position. Juha and the serac bivi. 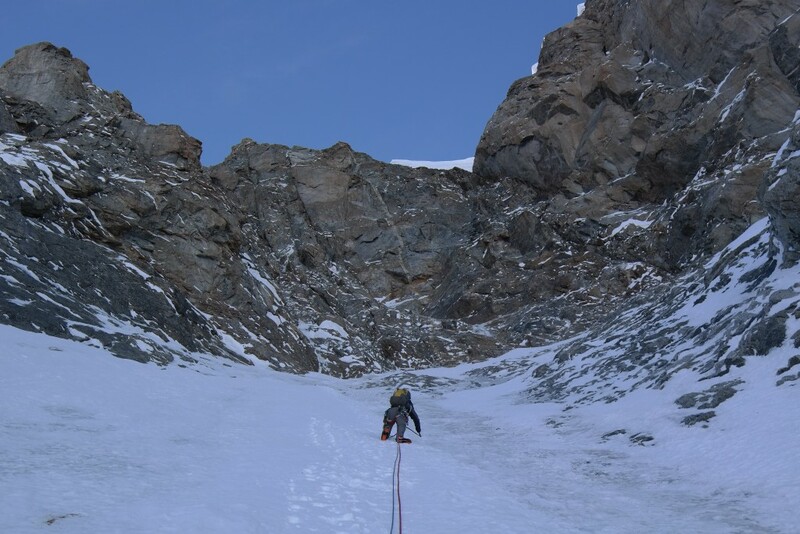 We simul-climbed everything else, but the hollow and steep ice crux at mid-height of the face, which was quite out there lead from Juha. Wouldn`t want to do that in thin conditions. 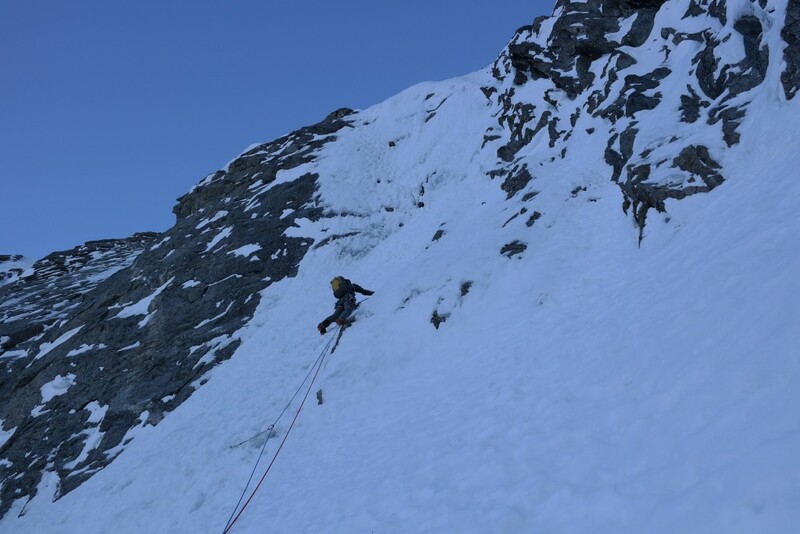 Climbing was again straighforward until the last six mixed pitches through the headwall. Juha led first three and I did the remaining job. Some delicate and careful foot work were needed, but nothing was harder than M4+. Juha starting up the steep ice crux (WI5). Mixed traverse pitch. Juha on the lead. Descent from Point Walker to the Boccalatte hut in Italy wasn´t a simple task. 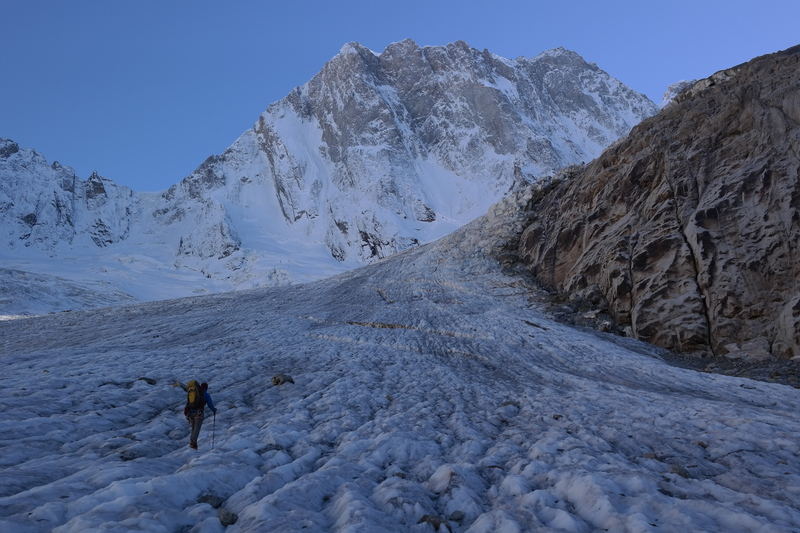 There were tracks to follow, but down climbing one axe in a sugar snow and the other in a Whymper´s serac required full concentration. It took ages. Just before 01:00 am we finally found the hut. Heaven of safety! Juho just below the Pointe Walker. Boccalatte refugio – Heaven of Safety.